U.S. Secretary of State Rex Tillerson listens to a question during a news conference in Nairobi, Kenya, March 9, 2018. U.S. Secretary of State Rex Tillerson, who is on the other side of the world on a week-long Africa tour, says President Donald Trump's decision to hold talks with North Korean leader Kim Jong Un came from Trump himself, but he downplayed any suggestion that the State Department was blindsided by the announcement. Speaking in Djibouti on Friday, the top U.S. diplomat said he spoke with the U.S. president by phone very early in the day. "We had a good conversation; this is something he's had on his mind for quite some time, so it was not a surprise in any way because I think this has long been something he's expressed it openly before, about his willingness to meet with Kim Jong Un," Tillerson told reporters. Tillerson made his remarks one day after South Korean officials, standing in front of the White House, announced the summit between Trump and Kim. Tillerson sought to temper expectations for a diplomatic breakthrough with North Korea just hours earlier on Thursday. "In terms of direct talks with the United States — and you asked negotiations, and we're a long ways from negotiations — I think ... we just need to be very clear-eyed and realistic about it," Tillerson said. When asked about what had changed in 24 hours, Tillerson made a distinction between "talks" with North Korea, and structured "negotiations." Tillerson said what stood out for him was what he termed the dramatic shift in Kim Jong Un's position. 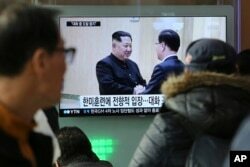 People watch a TV screen showing North Korean leader Kim Jong Un, left, meeting with South Korean National Security Director Chung Eui-yong in Pyongyang, North Korea, at the Seoul Railway Station in Seoul, South Korea, March 7, 2018. "Really what changed was his posture in a fairly dramatic way that, in all honesty, came as a little bit of a surprise to us as well that he was so forward-leaning in his conversations with the delegation from South Korea," the secretary said, referring to meetings this past week between a delegation from South Korea and the North Koreans in the North's capital, Pyongyang. Some former national security officials say it's likely Tillerson was unaware such an announcement could come from Trump. "We can only assume this announcement took the secretary by surprise because, earlier in the day, he [Tillerson] told reporters the United States was "a long way" from negotiations," said Jeff Prescott, a senior national security aide to former President Barack Obama, told VOA on Friday. "The secretary being out of the loop would fit a pattern of an erratic foreign policy that lacks process and rigor," he added. A number of North Korea and arms control experts have also expressed surprise at the announcement, saying they welcome talks, but are also concerned about the stakes of such a high-profile meeting, set to happen by May. Prescott says the Trump administration must do all it can to turn this potential opening into an opportunity to advance U.S. interests, not Kim's. "That objective has been made all the more difficult because this administration confronts today's news with one hand tied behind its back," the former Obama administration official said. "We have no ambassador in Seoul—not even a nominee—and no senior State Department official charged with overseeing the North Korean nuclear challenge." Robert Einhorn with the Brookings Institution welcomed news of the summit and that North Korea will suspend nuclear and missile tests while talks are underway. But the senior fellow for the Arms Control and Non-Proliferation Initiative said he has some reservations on the terms of such a summit. "I am concerned by President Trump's response to the invitation that he meet with Kim Jong Un — not that he agreed to meet but that he agreed to meet by May," Einhorn said. "Such meetings have to be well prepared, and the president should have insisted on lower-level exploratory talks that could test North Korea's seriousness before committing to a date." House Foreign Affairs Committee Chairman Ed Royce welcomed the summit announcement. "Kim Jong Un's desire to talk shows sanctions the administration has implemented are starting to work. We can pursue more diplomacy, as we keep applying pressure ounce by ounce," the Republican lawmaker said Friday. The ranking Democratic member of the House Intelligence Committee, Adam Schiff, noted the president should rely on experts in other parts of his administration to carefully prepare for such a meeting. "In the weeks before the summit, clear-eyed diplomacy and preparation will be vital, given the risks involved in such a high-stakes leaders meeting this early in a negotiation," Schiff said in a statement. "It will require the president to rely on the expertise within the State Department, the intelligence community, and throughout the government, and not simply on his own estimation of his skills as a deal maker.'" Former advisor to both Republican and Democratic secretaries of state Aaron David Miller told VOA the Trump administration currently lacks the experts on North Korea to prepare for direct talks. "Right now, it is hard to identify any single individual or team of individuals that has both the negotiating experience and knowledge of the history, the cultural and political sensitivity, and knowledge of how the North Koreans behave and how they see the world," he said.